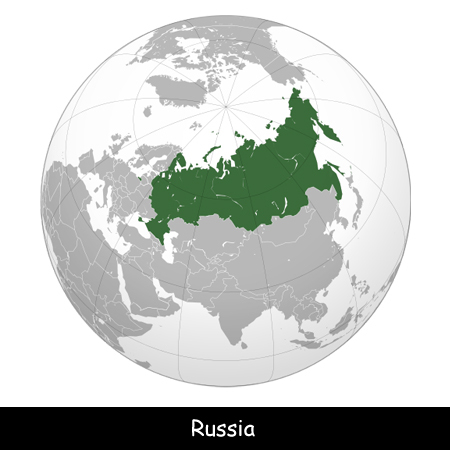 Russia is the world’s largest country by area covering approximately 17 million square kilometers. The country lies in both the continents, Europe and Asia. Moscow is the capital and also the largest city in Russia. The country is also one of the top producers of natural gas and oil in the world. There are a total of nine different time zones in Russia which is more than any other country in the world. Before it used to have eleven time zones. Russia is home to Lake Baikal which is the deepest lake in the world. It holds approximately 20 percent of the world’s unfrozen freshwater. The country’s official currency is the Russian Ruble. Major rivers of the country include Amur, Irtysh, Lena, Ob, Volga, and Yenisey. Russia shares its border with 14 different countries which are Poland, Belarus, China, Ukraine, Georgia, Azerbaijan, Norway, Finland, Estonia, Latvia, Lithuania, Kazakhstan, Mongolia and North Korea. The country is home to Mount Elbrus which is the highest point in Europe at a height of 5,642 meters. Russian is among the world’s top five most spoken languages. The country’s most famous animal species is the Siberian tiger, the largest cat in the world. The Russian flag is comprised of 3 horizontal stripes, white, blue and red. The Julian calendar was used until 1918 which was 12 days behind the Gregorian calendar. Yuri Gagarin was a Russian cosmonaut who was the first human to travel in outer space. Declan, Tobin. " Amazing Russia Facts for Kids ." Easy Science for Kids, Apr 2019. Web. 26 Apr 2019. < https://easyscienceforkids.com/all-about-russia/ >.